Over 46 million people choose to play sweepstakes, with a core of 5 million making a habit of it. Unlike gambling, sweepstakes are free to enter and give people a way to get something for nothing. At Cash Dazzle, they give away an average of $1,000 every day to lucky winners who are playing games, having fun, and winning cash. The concept of sweepstakes and contests is understood the world over. Any eligible person can enter by completing a short action, like Following someone on Twitter, submitting a recipe, or filling out a short form. Although sweepstakes today are used as a promotional tool for companies, causes, and organizations, they've served several historical purposes. It was contests that spurred on navigational discoveries, the popularization of the potato to avoid famine, and the invention of the tractor. Most of these contests were sponsored by governments, like when Napoleon Bonaparte offered a cash prize to find a better way to preserve foods for his faraway troops. The winning submission was a method of boiling and sealing food in a vessel, or what we now know as canning. Cash Dazzle has sponsors who pay to have their ads seen by members like you. You'll receive free tokens for viewing the ads during the 1st 5 days of membership and still earn more for new activities after that. The Cash Dazzle team wants to create the best user experience with games are easy to play and fun. 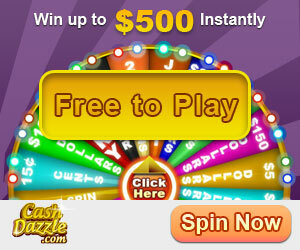 Register as a free member now and play for free to win cash at Cash Dazzle.